Felix's Blog: Why I Run (and Why You Should Give Us Some Money)! Last year, I ran my first half marathon. Relatively speaking, I was pretty slow, but I finished and didn't walk! 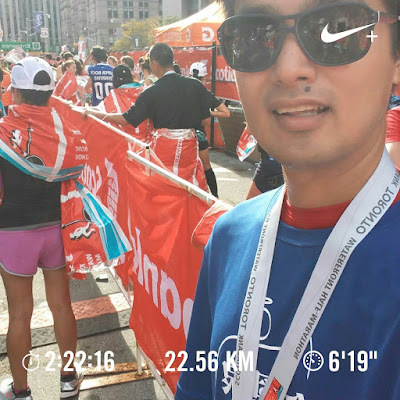 My goal for last year was to run a sub 2-hr half marathon, but I clocked in at 2:22 in the Scotiabank Toronto Marathon. It was a challenging year for me last year as work had, and continues to, take over a good chunk of my time. Including the drive, I'm easily clocking 12 to 13 hours a day. Not complaining, but just putting some context (or making up an excuse) around this narrative...but this is not what we're talking about today. What I want to talk about is the reason for me to run. I have never been a runner. The last organized race before the half marathon that I participated in was when I ran a 2 km cross country race in Grade 5! I wouldn't say I wasn't an active person, however. As a kid, I rode my bike everywhere, 365 days a year. I had mastered the art of jumping off a bike and landing safely when I slipped on black ice. It wasn't that I loved riding bicycles, but rather, it was out of necessity. I had a paper route and as part of that job, I had to go to my customers to collect the paper money. Riding a bike was way better than walking. Growing up, I had trained in Karate for about 10 years, and so, was in relatively good shape. Then university happened and things just kind of went downhill there. I never really got fat, but was just not in great shape. Two years ago, I attended a conference in San Francisco with Meredith, one of my staff, and on our last day there, we had a morning to sight see before our flight back. She suggested that we rent a bike to see the Golden Gate Bridge and other parts of the city. I wasn't thrilled about the idea especially when SF is a very hilly city. It turned out to be a very difficult bike ride because it was either very hilly or very windy by the sea. Meredith did just fine, but I was dying trying to catch up to her. When I first started dating Renee, I learned that her father, Johnson, runs the half marathon each year. At that time, he was in his 50s and I was so impressed. Eventually, his knee (like mine) would complain and he gave it up for less impactful activity. I've never told him this, but a big part of what made me want to run a half marathon was seeing him do it year after year! Great job, Dad! So Why Did I Start Running? As a lot of you were so generous in past years, you know that at least part of the reason for me to run is to raise funds for my kids' school. I figured that to get you to part with your money, I had to give you a pretty good reason to do it. Subjecting myself to unnecessary pain would probably not be a bad idea. The year before last, I shaved my head to achieve that goal. This coming Saturday, June 9, we will be doing a 5 km walk with the school while praying 5 x 5 decades of rosary. I don't know, but I think the latter might actually be more difficult for the kids (and perhaps adults)! I will also be doing a half marathon this fall, aiming to do it under 2 hours as I mentioned above. There is, however, a deeper reason to my running. It has to do with conditioning myself mentally. For what? I don't quite know. I do know that pretty much half my life is now in the past, and while I've accomplished some things in life (marrying a wonderful woman and having 5 beautiful kids), I feel a calling to do more. It's that primordial human desire to achieve more. Over the years, I've come to understand better how to discern God's calling. There are literally an infinite number of ways that one can live out one's life, but there are only a few, or maybe just one way that God is calling you to live. How does God do that? I don't think it comes from a booming voice from heaven, nor through visions like those experienced by St. Teresa of Avila. Rather, it often comes as a deep and recurring desire and feeling that one has. I was originally going to spend some time talking about my experience discerning the will of God, but that turned out to be a rather long-winded post. I will leave that for my next post! What I want to say is that there is a deep desire within myself to make a greater impact to those around me. I also recall one of my favourite verses from the Parable of the Talents: "Well done, my good and faithful servant. Since you were faithful in small matters, I will give you great responsibilities. Come, share your master’s joy" (Matthew 25:23). In the same way, running for me is the "small matter". There's nothing complicated about running, if you put in the time and effort to train, you will get faster and run farther. It is as simple as that. While simple, it is not easy. However, if I cannot achieve even a simple task as setting aside time to train for a half marathon, how will I be able to achieve greater things? So running is the beginning. If I can't make a simple physical sacrifice, how can I make greater sacrifices for my family? If I can't bear physical discomfort, how can I be prepared for greater trials? Therefore, conquering the 21.1 km is the first milestone of the second half of my life journey. Hope you can be part of it! And so, I'd like to thank those who have helped in the past for your generosity. You are "stor(ing) treasures in heaven!" (Matthew 6:20). I humbly ask for your help again! And perhaps you've enjoyed reading my blog posts. My more popular posts have gotten upwards of 700 pageviews! I'm grateful for your readership! 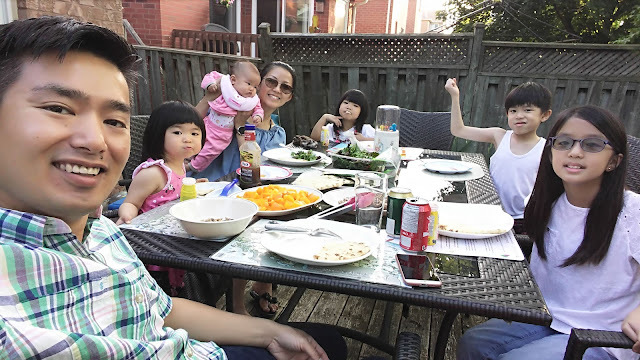 Our Family Thanks You from the Bottom of Our Hearts! Wait! The Government is Matching Your Donation! Ok, so no, they're not matching your donations, but you can think of it this way: when you donate, say, $100. You will get a tax receipt. When tax time comes around, that tax receipt can get you close to 40% of your donation in tax credits. So, in effect, when you donate $100, it's like donating $60, with the government "matching" it with $40 of their money! Free money, who doesn't want that!! So, please help us walk 5 km with 5 kids, saying 5 decades of rosary 5 times! Our fundraising goal is $3000. Again, thank you so much for your generosity! God bless!